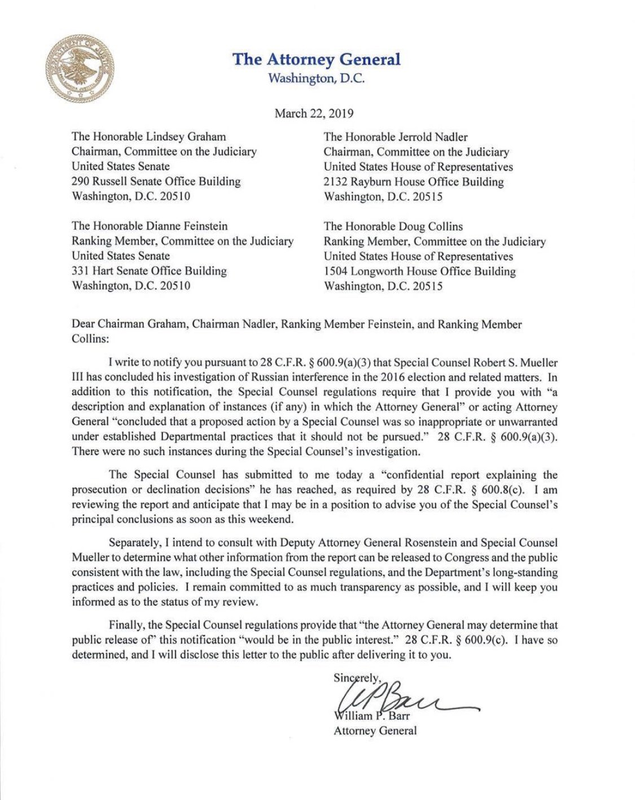 Update: Lawmakers are expected to receive the report's principal conclusions this weekend, as Barr suggested might happen in his letter. 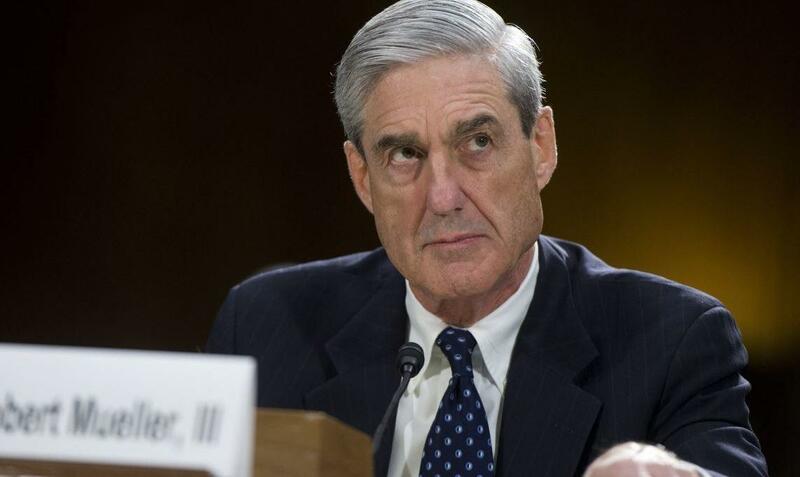 Special Counsel Robert Mueller's long-awaited report is complete, nearly two years after he was named to oversee the investigation into obstruction of justice, possible collusion between the Trump campaign and Russia, and literally anything else that came up. Barr has told congressional leaders he is "reviewing the report and anticipate that [he] may be in a position to advise [them] of the special counsel's principal conclusions as soon as this weekend." Meanwhile, Mueller has indicated that there are no further indictments expected. It is long past time for @realDonaldTrump to now declassify everything related to DOJ/FBI surveillance of his campaign and administration, illegal leaks of top secret information, and corrupt operation of America's top law enforcement agencies. The public deserves to know. "Robert S. Mueller III has concluded his investigation of Russian interference in the 2016 election and related matters. In addition to this notification, the Special Counsel regulations require that I provide you with "a description and explanation of instances (if any) in which the Attorney General" or acting Attorney General "concluded that a proposed action by a Special Counsel was so inappropriate or unwarranted under established Departmental practices that it should not be pursued." We now get to look forward to Rep. Adam Schiff (D-CA) and other Democratic lawmakers, who now control the house, continuing the investigation and Russian collusion and "literally anything else" they can come up with. In fact, probably right up until the 2020 election. We would imagine a sharp dropoff in accusations upon a second Trump victory. "We’re going to insist on the underlying evidence," said Schiff in February on ABC's "This Week." "If you take the position that the president cannot be indicted, and the only remedy for improper, illegal or other conduct is impeachment, then you cannot withhold that information from Congress, or essentially the president has immunity," he added. In a statement following Friday afternoon's news, House Speaker Nancy Pelosi (D-CA) and Senator Chuck Schumer (D-NY) said "Barr must not give President Trump, his lawyers or his staff any ‘sneak preview’ of Special Counsel Mueller's findings or evidence," and that the White House should not "interfere in decisions" related to how much should be made public." We wonder why it hasn't leaked by now? Surely the anti-Trump media has friends in high enough places based on their network of "anonymous sources." Conservatives have been celebrating the late Friday submission as a win, following several rumors that Democrats would be dealt a "dud." Oh, and about Mueller "Closing In"
I write to notify you pursuant to 28 C.F.R. §600.9(a)(3) that Special Counsel Robert S. Mueller III has concluded his investigation of Russian interference in the 2016 election and related matters. In addition to this notification, the Special Counsel regulations require that I provide you with "a description and explanation of instances (if any) in which the Attorney General" or acting Attorney General "concluded that a proposed action by a Special Counsel was so inappropriate or unwarranted under established Departmental practices that it should not be pursued." 28 C.F.R. § 600.9(a)(3). There were no such instances during the Special Counsel's investigation. Finally, the Special Counsel regulations provide that “the Attorney General may determine that public release or” this notification “would be in the public interest.” 28 C.F.R. § 600.9(c). I have so determined, and I will disclose this letter to the public after delivering it to you.